On International Women’s Day earlier this month, Hillary Clinton wore a red pantsuit and bangs to give a speech at the Kennedy Center for the Performing Arts in Washington, D.C.
A week later, Hillary stopped traffic on New York’s Fifth Avenue as she came out of the Bergdorf Goodman hair salon, where she got a $600 dye job and a $600 haircut. The bangs were gone and her hair was several shades lighter. 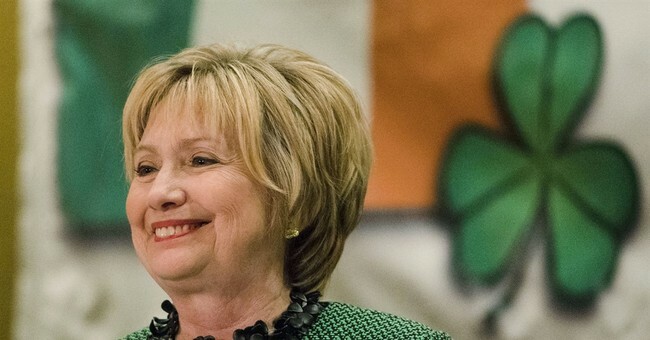 Experience tells us that when Hillary experiments with her hair style, she’s up to something. I reported on that “something” a month ago when I revealed that, as fanciful as it might seem, Hillary has plans to run again for president. Meaning there aren’t going to be more walks in the woods near her home in Chappaqua, New York, because she’s gearing up to do battle with Donald Trump. She doesn’t have to worry about competition from Barack Obama. Recently, the former president did a disappearing act on his Democratic colleagues and took off on a month-long vacation (without Michelle) at Marlon Brando’s luxurious resort in French Polynesia. According to a source close to Hillary, she is putting together an entirely new staff to lead the opposition to Trump. She’s already brought back the irreplaceable Huma Abedin—the only person Hillary has decided to keep from the inner circle of her presidential campaign. “She’s looking for speech writers and advance people,” said the source. “It’s real important to her that they be new blood. She believes the old guard failed her in the campaign. “She says she is going to get back to work, high profile,” the source continued. “She wants to change her image—liven it up. She wants to reinvent herself. She’s working on putting together a war chest, getting a leased plane—the whole stuff of campaigning. “She has many requests for interviews, appearances and speeches, and she’s weighing which ones to do. In the next months she is going to be all over the place, speaking up and raising hell."